On Tuesday night, selectmen learned that Southborough police were investigating complaints about a used car dealership in town. Yesterday, the SPD announced that it was issuing a warrant against the owner of Right Way Auto Sales. If you believe you were the victim of “an illegal transaction”, they want you to let them know. At a December Board of Selectmen meeting, Town Administrator Mark Purple discussed the used car dealership alleged non-compliance with license requirements. He told them that the police found posted hours beyond those approved and 8 more vehicles for sale than the 14 allowed under its permit. He was sending a letter to notify the owner about compliance issues and that the board was looking into its license. This week, Purple updated the board on the situation. He said the owner had responded that he was unaware of the issues and would fix them. But he followed that he was recently made aware of other issues with the dealership. He referred to the inability to get the title of a vehicle purchased and issues with refund checks. Purple told the board that police would be providing a report that he would review with the Chief. Depending on what they learned, he would discuss with Chair Lisa Braccio whether to bring the license owner in for a discussion or a revocation hearing. Selectwoman Bonnie Phaneuf asked him to send a letter to the owner notifying him that they were conducting a review. Based on Chief Kenneth Paulhus’ press release, I’d guess the board will be considering revocation. 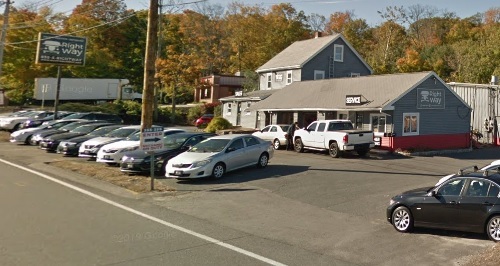 Over the past two days, the Southborough Police have taken numerous complaints of fraudulent used vehicle transactions involving Right Way Auto Sales, located at 355 Turnpike Road. As a result of an investigation, Detective Keith Nichols obtained an arrest warrant for the owner [a Hudson man]. He will be charged with three counts of Larceny Over $1200 By False Pretense, 266/34/A. Additional charges are expected to follow when [the accused] is located. Anyone who has been the victim of an illegal transaction at Right Way Auto, or has further information (including [the owner’s] whereabouts), should contact Detective Nichols at (774) 249-0355 or (508) 485-2121.